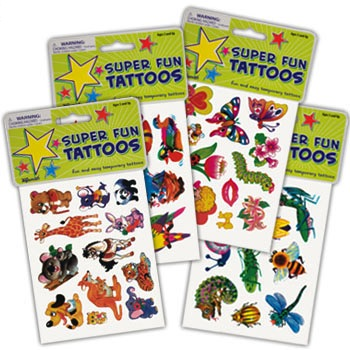 Butterflies, hearts, flowers, frogs, fish and birds are just a few of the designs in this assortment of safe, removable tattoos. Removed easily with rubbing alcohol. Each sheet contains 8 to 12 tattoos. Assorted styles. Made by Toysmith. Price per pack.